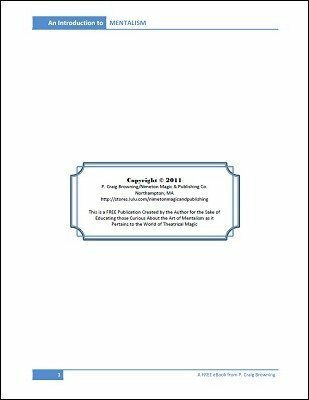 Written by Craig Browning for the sake of educating those curious about the art of mentalism as it pertains to the world of theatrical magic. 1st edition 2011, 46 pages. Don't let the price fool you. This fine primer is worth at least a dollar a page for any starting mentalist. Mr. Browning expresses himself admirably as he guides the reader like the mentor that most of us wish we'd had. The groundwork he lays is sure to raise a fine crop of mental magicians and mentalists. I tip my hat to you sir and assure you that yours has become the first book on my recommendation list for budding "mind wizards".